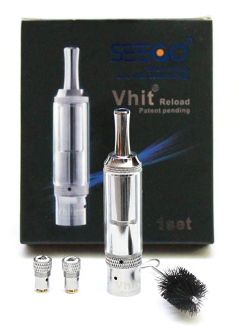 Introducing the vHit Reload Dry Herb Atomizer from Seego. The Vhit Reload is designed specifically for use with dry herb and is the latest and most advanced dry herb atomizer out there. It has an easy load/unload design with a mouthpiece that pushes down to trigger a cashing feature. Also, it has a completely rebuildable atomizer. This allows you to completely dissasemble the atomizer for cleaning and maintenance. The Vhit Reload Atomizer is made of Pyrex glass and premium stainless steel. The Pyrex gass makes this atomizer much easier to clean and the stainless steel body is durable and resiliant. The Vhit Reload produces intense vapor clouds and is easy to use. You will love the ease of use it will bring you and the clouds of vapor it produces. - The burner, or bowl head can be detached to safeguard from damage while the atomizer is being cleaned. - The reload chamber is a patented design that allows you to remix the dry herb without having to open the atomizer. To pack and stir the contents during use just push the mouthpiece down. When the chamber is finished, simply push down the mouth piece to empty and reload your next chamber. The set comes complete with dry herb atomizer, 2 extra replacement coil heads, and cleaning tool. - It is self-cleaning. It will clean itself without the use of any tools. Unscrew the base from the atomizer. Put an appropiate amount of dry herb into the chamber bowl head. Replace the base by screwing it onto the atomizer. Screw the atomizer onto the battery. - Do not overpack the chamber (This will decrease the airflow and reduce performance) - Grind the dry herb finely. - Clean the chamber on regular basis.